Is “The Kissing Booth” a Good Movie? In a war between young adult novels turned chick flicks, “To All the Boys I’ve Loved Before” takes the land. “The Kissing Booth” loses half of its men and its kingdom. 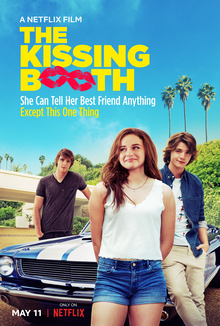 “The Kissing Booth” is a teen romantic comedy with elements of every other cliche movie. While most people love it simply because it’s a disaster of a film, I couldn’t even finish it. “The Kissing Booth” is the story of Elle (Joey King) and Lee (Joel Courtney), two best friends since birth, who follow an uncomfortably long list of rules each of them has compiled. When Elle breaks Rule #9 and falls for Lee’s older brother, Noah (Jacob Elordi), the movie really gets going. The love triangle trope is so overdone, that because Elle and Lee are just besties, it sounds original. 1) Lee and Elle have agreed on Rule #9, but the rule really only applies to Elle. Throughout the movie, both of the brothers try to control Elle in one way or another. Lee does so by coming up with the rule that she cannot date or even crush on his older brother. Elle’s little brother is definitely not older than 7, so the “relatives are totally off limits” rule clearly does not apply to Lee. It’s kind of gross because Lee doesn’t even like Elle, he just doesn’t want Noah to have something over him. Gross. Noah says a lot of yikes things through the movie, and Elle takes care of his anger issues almost every time. After Elle is sexually assaulted at school, Noah tells her that because she wore such a short skirt, she was asking to be groped. Noah is one of those guys that are to blame for women not coming forward about assaults. Victim-blaming is never cool, but she is in love with him anyways. 3) Noah is controlling, and should probably see a therapist for his anger issues. Even before they get involved with each other after the kissing booth scene (see title), Noah tries to control aspects of Elle’s life. When she agrees to go on a date with her assaulter (yikes), she gets stood up. The guy tells her that he didn’t show because Noah threatened him. He then admits that he isn’t the only guy Noah has warned. He spends the entire movie trying to tell Elle what to do and how to handle situations. He also spends it getting into many, many fights. Somehow, he still manages to get accepted to Harvard, and for what? I still don’t know. I didn’t finish the movie. 4) Elle and Noah’s relationship is toxic. That one is pretty self-explanatory, I’d say. See reason 3. 5) Noah and Lee’s house is huge, but there’s no explanation of what their parents do. Is it because of Molly Ringwald’s success? This doesn’t seem practical. He gets into fights, controls her life, acts like her father, and he’s a player, but she still doesn’t let it bother her. Doesn’t seem like a difficult decision though, since he smells yummy! Coming from a girl that adores low-quality horror films, I guess I can’t be the one to judge you if you enjoyed this Netflix movie. Do you, but look out for these things shall you choose to. To be fair, this is definitely a generic high school chick flick. But also, what’s wrong with that? Some of the characters are garbage, I can admit it, but overall it’s pretty good. The main character is Elle Evans, not Ellen and not Shelley, unless you’re a very attractive senior. She has unfailingly messy brown hair, but that’s about the extent of her physical faults. While she can be a girly girl, acknowledging her use of makeup and an appreciation for pink prom dresses, most of the time she can be found playing soccer and working as co-captain of the dance team with her best friend since birth, Lee Flynn. I must admit, I was surprised to find out that Lee wasn’t gay. When his straight “nice guy” attitude was established, I fully expected him to fall in love with Elle. However, that isn’t what happens. This is mainly because Elle is undeniably in love with Lee’s older brother, Noah. Noah, better known by his last name “Flynn,” is the stereotypical bad-boy. He gets into an insane number of fights, usually over Elle, which Elle then feels obligated to break up. Elle and Lee decide to create a kissing booth for their school fair. This is only approved by the student board when they agree to get Noah to participate. Of course, he says no. Noah winds up kissing Elle in front of the entire school, and Lee tells Elle that he is not okay with her dating his brother. Elle finds herself being forced to choose between her best friend and the guy she loves. Tragic. I do have to say, the feminist inside of me is screaming at me to hate this movie. Elle is constantly pushed around by both Flynn boys, but she still stands strong most of the time. Elle puts her personal safety over her pride time and time again. When she’s afraid or angry, she says it. She ignores it when people call her bossy, and chooses herself over either boy.